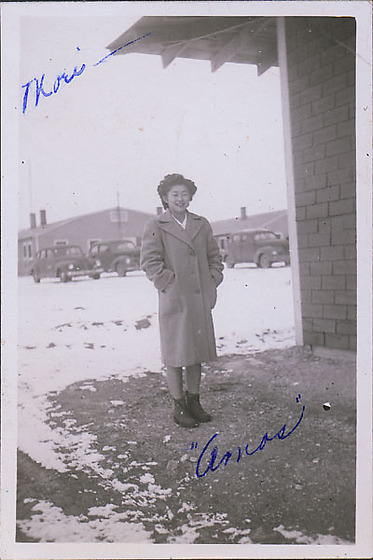 Portrait of a young woman, "Amos," in overcoat standing near brick building with cars in background at Heart Mountain concentration camp, Wyoming, Winter 1944-1945. She stands with hands in coat pockets in area under eaves of building and smiles at viewer. Surrounding area has snow on ground. Her hair is curled and her legs are bare in short boots. Mess hall and cars in background. Written in blue ink on image: Mori-- / "Amos"